Wound dehiscence is where a wound fails to heal and re-opens a few days after surgery. Full thickness dehiscence (often termed burst abdomen) – the rectus sheath fails to heal and bursts, with protrusion of small bowel and omentum. Wound dehiscence is a costly post-operative complication and thus identification and appropriate management of the condition is key. The most common cause of wound dehiscence is infection (see surgical site infection). This is one reason why early identification and treatment of any surgical site infection is important. There is some evidence that washing the wound with an iodine anti-septic solution (e.g. Betadine) reduces the rate of wound infections and dehiscence. The risk factors for wound dehiscence are listed in Table 1. The most evident feature of wound dehiscence is the visible opening of the wound (Fig. 1), healing poorly following the operation; this typically happens around day 5-7 post-operatively. A classic sign of deep / full thickness dehiscence (where the skin is often intact initially) is new bulging of the wound and seepage of pink serous or blood-stained fluid from the wound. A sudden increase in wound discharge is deep dehiscence until proven otherwise*. *Such a presentation will mandate removal of the skin clips / sutures at the area of maximal leakage and physically examining the rectus sheath with your finger to check it is still intact. The diagnosis of wound dehiscence is a clinical one. For cases with concurrent surgical site infection should have wound swabs taken for culture at the wound site. Superficial dehiscence usually just requires washing out the wound with saline and then simple wound care (e.g. packing the wound with absorbent ribbon gauze). The patient should be advised the wound will now be required to heal by secondary intention and that this can take several weeks. More extensive wounds may be treated with a Vacuum-Assisted Closure device to speed healing. In the event of a sudden full dehiscence of a wound (or “burst abdomen”), provide suitable analgesia and start IV fluids. Broad spectrum IV antibiotics should be started as a priority. Cover the wound in saline-soaked gauze and arrange urgent return to theatre for re-closure of the wound. This is usually done with large interrupted sutures; if the sheath won’t come together then it may be necessary to manage the wound as an open abdomen and apply a vacuum dressing. Optimisation of co-morbidities and treating any surgical site infections is key in the prevention of wound dehiscence. Avoiding heavy lifting and encouraging adequate post-operative nutrition will reduce the risk further. Which of the following is not a significant risk factors for wound dehiscence? You are called to see a patient who is 5 days post-laparotomy. He has pink serous fluid seeping from his wound. You assess him and his observations are normal. What is your next step in his management? 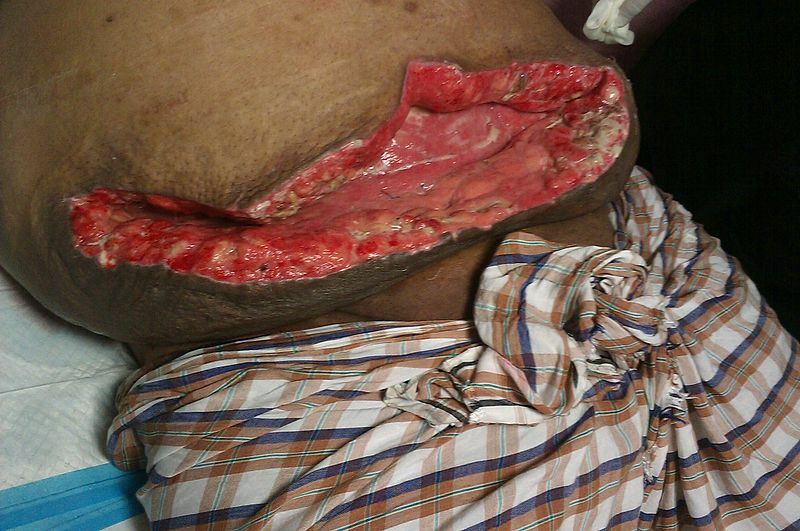 You are called to see a patient who’s wound has dehisced and he now has bowel protruding from his abdomen. What is your next step in the patient’s management?